For this project I really wanted to create something to do with the night sky/space, because I love clothes with those kinds of patterns. 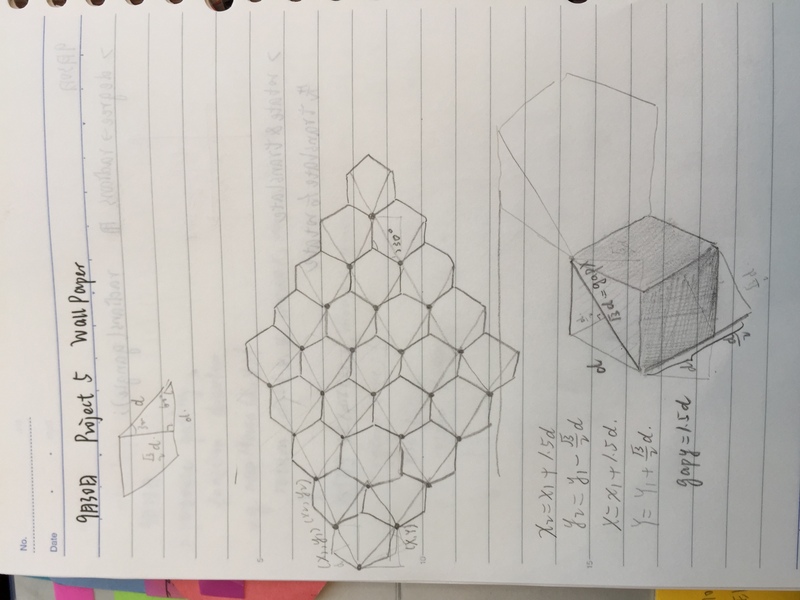 I started with the sketches below. 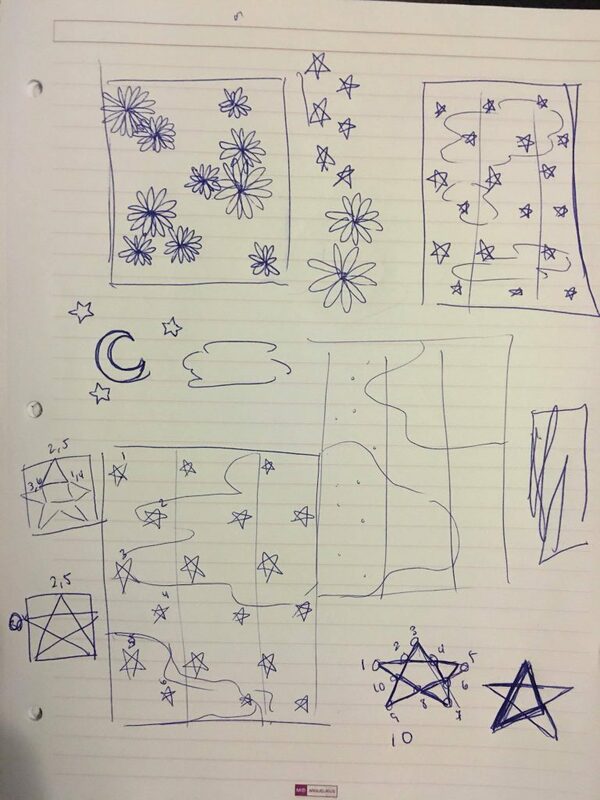 Being able to create the stars ended up being… considerably harder than I thought, but I think I learned a lot from it. 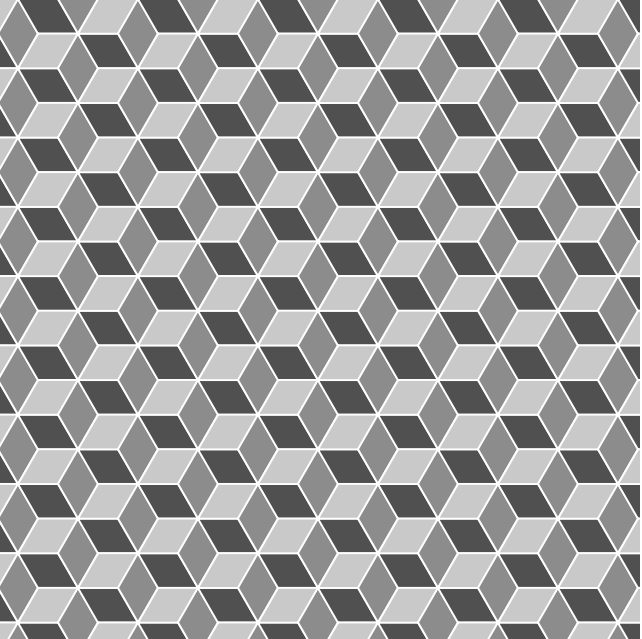 Using nested loops, I made this seamless pattern by drawing quadrilaterals and create an illusion of boxes. 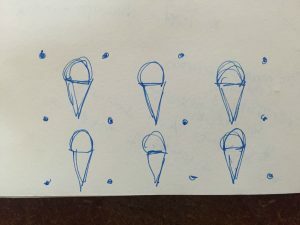 I was inspired by the ice cream cone I was eating at night. 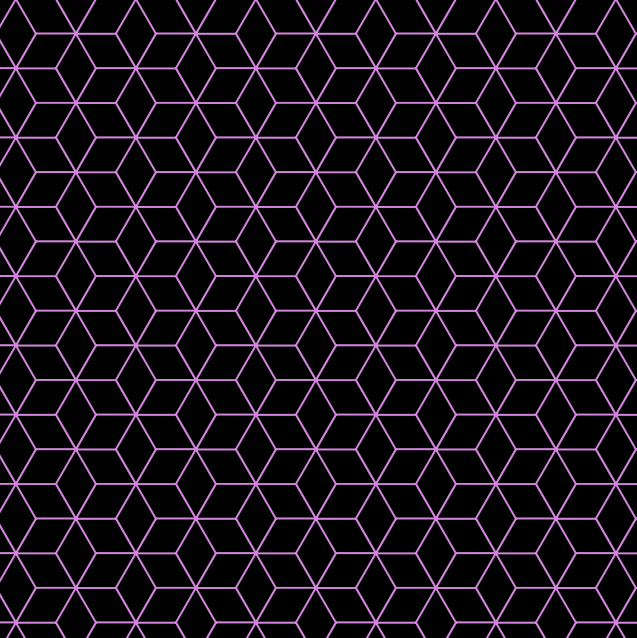 I wanted to do this project by using hexagons as the basic tiles because they merge so well. I used value because I liked how they conveyed space so well. Looking through all kinds of 3D computer graphic projects, I naturally paid more attention to architectural visualization since it relates to my major. I discovered a rendering animation of Kenzo Tange’s Yoyogi Olympic Arena in celebrating the 50th anniversary of Tokyo hosting the Summer Olympics. The rendering is created by professors and students from Harvard GSD as part of their course projects. I admire it because architectural rendering takes a huge amount of time and could be repetitive or boring during the process. Their animation pictures the Arena even better than photos. Not only architectural details are shown, but also the relationship between the surrounding and the building was nicely integrated. In order to make such rendering, the students have to make a digital model of both the exterior and interior of the arena. Then they would render the building in softwares such as Vray and Maya. They also have to match all the materials to every single part of the arena. Their product is very impressive aesthetically. Natural lighting and shadows are time-lapsed and even the reflections on the windows are nicely mimicked. Different angles of camera takes the viewer to multiple key details that might lost in photos. The materials and colors all fit together to make it a really successful visualization. I was inspired by Korean traditional pattern to create this wallpaper. Flower and the symbol are both important symbols in Buddhism which dominated ancient Korean times. 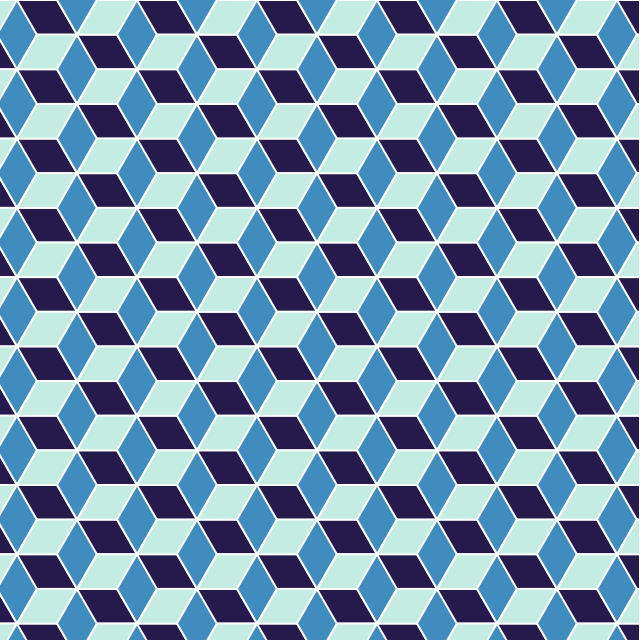 I created an alternating grid of circles with rectangles filling the spaces in between. 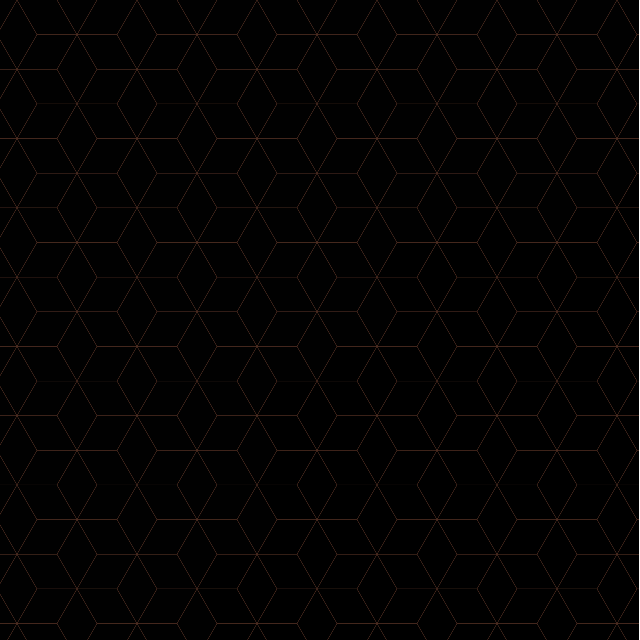 I then created a function that created zig zagging lines to link together the circles in a rectangular way. 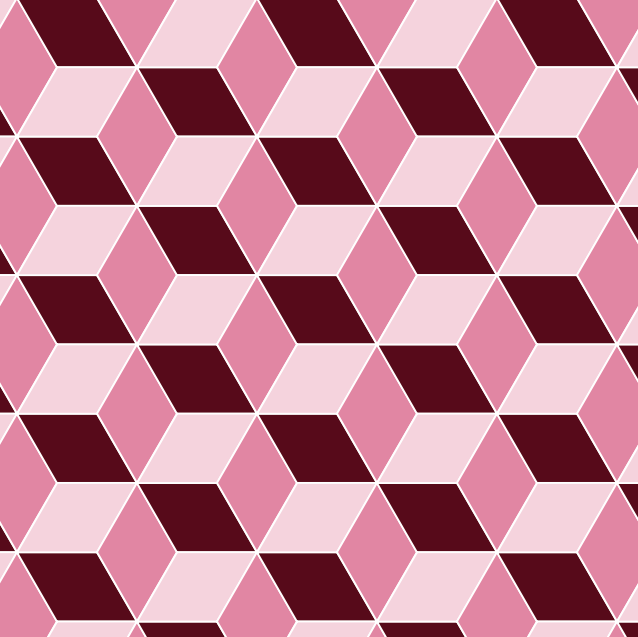 I tried connecting the circles so that they are somewhat hidden by the lines even though their shapes are still visible so that the attention is drawn onto the brighter colored squares that stand out in the center of the peach background. In this project I wanted to illustrate the “Demographic of the Internet”, which is essentially people going to the bathroom using their smartphones. 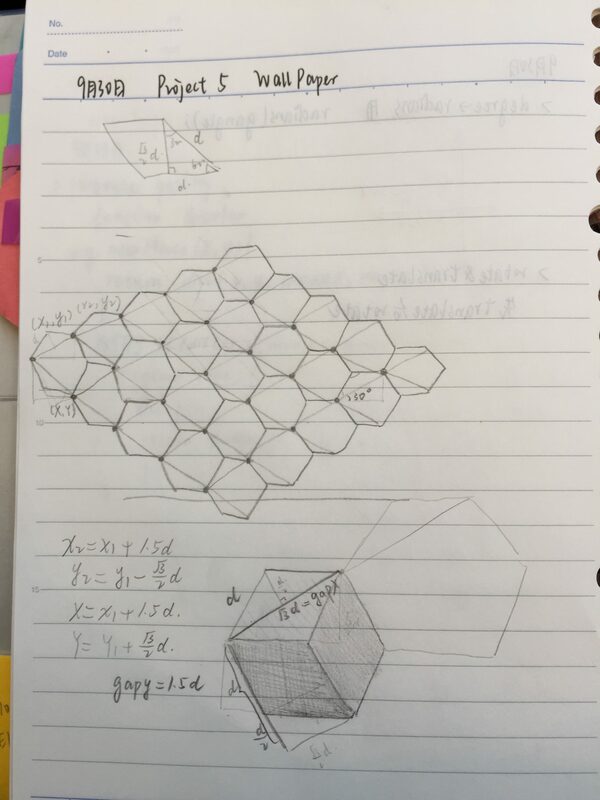 I really enjoyed the illustrative part of this assignment and I learned more about for loops. I’ve always been fascinated by the small processes in biology that are not able to be seen by the human eye. I was drawn to Andy Lomas’s Cellular Forms because he created an animation of forms that was modeled after cellular growth. I admire that Lomas chose to create a graphic that took inspiration from biology but did not model the animation after any particular organism, leaving the interpretation up to the viewer. Lomas created the graphic by starting with an initial cluster of cells and then adding complexity to the structure. Lomas used parameters to measure and control the accumulated nutrient levels in the cells to monitor when a cell would divide. Once a certain nutrient level was reached, the cell would divide and reconnect with neighboring cells. I suppose that due to all of the repetitions in the work, Lomas must have used loops or a variation of them. Lomas was also interested in the reactions of his viewers. He believed that there was something deeply psychological in humans where if we see these biological processes we feel connected to the biological forms. Being the CG supervisor for the movie Avatar, I believe Lomas is very invested and successful in creating an appreciation for biological processes in his viewers.